As more and more electronics are packed into vehicles the thermal hazard potential has risen sharply. And this has led to a growth in the market for automotive thermal fuses. Thermal fuses are designed to disconnect circuits safely when a specified allowable operating temperature is exceeded, thereby preventing a possible vehicle fire. A recent report into the global thermal fuses market, and its automotive sub-sector, points to significant growth in the market to 2023. Key thermal fuse suppliers include: Schurter, Xiamen SET electronics, Tamura Corporation, TE Circuit Protection, DF Electric, Elmwood Thermal Cut-Offs, Bel, D&M Technology Manufacturing, Italweber, Ivaldi and Mersen. Lucerne headquartered Schurter is a developer of customized solutions and recently showcased its SMD thermal fuse range for high currents. The range has applications in automotive cooling fans, ABS power steering, PTC heaters, HVAC, glow plugs and diesel fuel heaters. Hong Kong based D&M Technology Manufacturing, meanwhile, has launched a range of automotive thermal fuses for use in dimmer switches, cigarette lighters and radiator fans. The most important function of an automotive thermal fuse is its cut-out function. And this is because the consequence of a fire in a moving vehicle, if the thermal fuse fails, could be disastrous. In recent years, this was amply demonstrated in the UK by the spate of Vauxhall Zafira fires that in May 2018 prompted a joint investigation between the Driver and Vehicle Standards Agency (DVSA) and Luton Borough Council trading standards. The model affected was Vauxhall’s Zafira B, which is no longer on the market. However, between 2005 and 2014 more than 230,000 were sold with manual or no air conditioning. Vauxhall recalled 200,000 Model Bs in November 2015. This was followed by a second recall in May 2016 for 234,000 cars of the same model. Vauxhall is now fully complying with the investigation and for its part blames the fires on “unauthorised repair” of the thermal fuse in the Vehicle’s blower resistor. Nevertheless, the Vauxhall incident precisely illustrates for some in the automotive industry one of the many problems with thermal fuses and why it is time for the industry to move on to ‘smart fuses’. Writing in a joint op-ed, Martin Jaiser field applications engineer specialising in automotive applications at AMS AG the Austrian headquartered designer and manufacturer of high-performance sensor solutions, and Manfred Brandl, senior product manager in the mobility sensors division of AMS, argue that thermal fuses are “too slow and inconvenient” for the increased demand that the modern car places on their electronic systems. “The typical fuse in a car is blown after around 20-50ms when subject to 10x its nominal current. And because a fuse cuts out when triggered, it has to be replaced after every over-current event. In fact, when today’s cars have so much modern technology inside them, such as touch-screens, voice recognition and sophisticated driver-assistance systems, the antiquated tool and obscure process for replacing a traditional fuse seem out of place,” they say. It can also provide a much more precise maximum-current trigger point. This gives the potential to reduce cable diameter when compared to thermal fuse protection. According to AMS, a modern mid-range car carries more than 1.5km of cable weighing more than 40kg. Another advantage of the electronic fuse is in the configuration of the power network. Electronic fuses can be placed virtually anywhere in the car and unlike thermal fuses they do not need to be gathered in one fuse box. So although thermal fuses have the current advantage of being cheaper than intelligent fuses, AMS says intelligent, electronic fuses have the potential to cut total costs in the very near future, as well as to reduce the weight of the vehicle substantially. Indeed, AMS has now introduced a reference design board, which it says, “shows the industry a design concept for an accurate yet simple intelligent fuse.” The concept is said to give OEMs the opportunity to evaluate the concept, understand its advantages and cost, and simulate its operation in complex power systems. 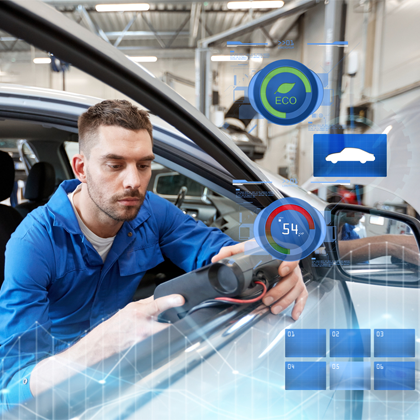 In the final analysis, though, vehicle safety considerations will determine what limits there are if any to automotive electronics’ sophistication. Fire safety will also be the deciding factor when OEM manufacturers choose whether to plump for thermal or intelligent fuses.